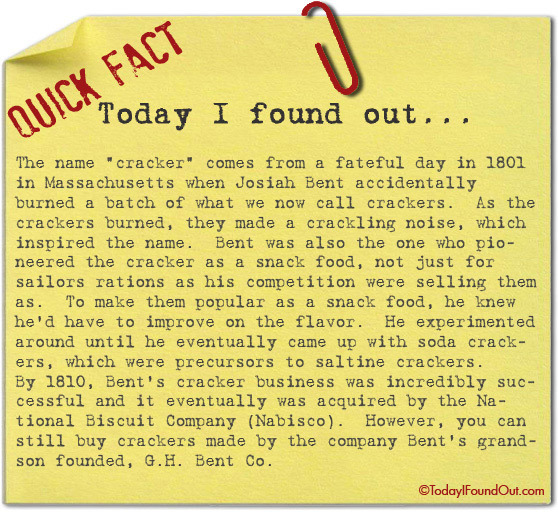 The name “cracker” comes from a fateful day in 1801 in Massachusetts when Josiah Bent accidentally burned a batch of what we now call crackers. As the crackers burned, they made a crackling noise, which inspired the name. Bent was also the one who pioneered the cracker as a snack food, not just for sailors rations as his competition were selling them as. To make them popular as a snack food, he knew he’d have to improve on the flavor. He experimented around until he eventually came up with soda crackers, which were precursors to saltine crackers. By 1810, Bent’s cracker business was incredibly successful and it eventually was acquired by the National Biscuit Company (Nabisco). However, you can still buy crackers made by the company Bent’s grandson founded, G.H. Bent Co.
Nice bit of marketing spin by Mr. Bent, but “crackers” in reference to hard wafers dates to the 1400s, and in the modern sense to the 1730s.